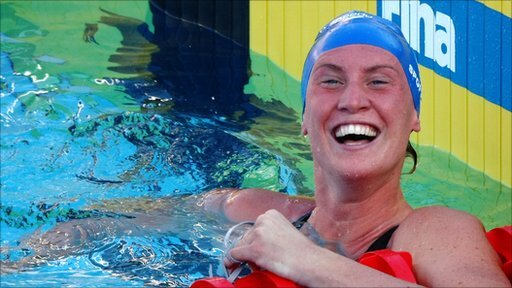 World champion Gemma Spofforth is to continue living and training in Florida after British Swimming agreed funding. Spofforth had been faced with either funding herself or returning home as the sport's governing body normally only supports swimmers based in the UK. However Spofforth lived in the United States before the 2008 ruling and has now been granted funding support. "It's amazing what they've done for me and I can now focus on reaching my peak for London 2012," said Spofforth. She will train with the rest of the GB squad ahead of the British Championships in Manchester in March, before returning to the United States. Backstroke specialist Spofforth, who was born in Sussex, graduated from the University of Florida last year after captaining their women's swimming team to the national title. She currently works part-time at a crisis centre in Florida, counselling callers to a suicide hotline. But for now she will focus full-time on the British Championships, which double up as trials for July's World Championships in Shanghai . She will spend six weeks training on Australia's Gold Coast, then join GB coach Kevin Renshaw's group at Loughborough University. "Renshaw is a great coach and I'm looking forward to the change in stimulus." Spofforth told BBC Sport. "Spending time in Australia and then back in the UK will keep me fresh for the Championships and then hopefully for when I head back to America afterwards." Despite adding a European Championship gold to her collection with victory in the 100m backstroke in Budapest last year, Spofforth reflects on 2010 as being a "poor year" for her personally after she failed to claim a title at the Commonwealth Games . "Although the year looked like a success, for me it wasn't. I finished second in pretty much every event that I raced," said Spofforth. "With everything that went on around Delhi, with all of the talk about people getting sick, it was really difficult to put the focus on swimming and do the best that we could all do. "It means I've now got a new focus, though. Although I was good in 2009, 2010 wasn't as great, so 2011 needs to be better." It should certainly be a little less hectic for the swimmer who in 2010 combined her Great Britain responsibilities with captaining her university team. She led the Gators to victory in the NCAA Championships , the largest an most prestigious inter-college competition in the United States, an achievement which she ranks as the highest in her career. The reward for winning Florida's first National Championship since 1982 was a visit to the White House and the chance to meet US President Barack Obama. "Winning with my team was a better experience for me than my world record and my world championship. "Knowing that you've all trained together for that one common goal is really special and is something I will miss now I've graduated," said Spofforth. 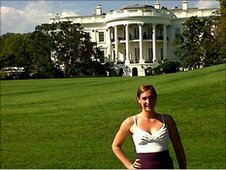 "It was an amazing day, going up to Washington and listening to President Obama give a speech, which was really inspirational. "I actually shook his hand afterwards and to have now met both the Queen [after the 2008 Olympics] and the President is incredible." Spofforth is determined to be more focused in the run-up to 2012, blaming over-confidence for her failure to win a medal in Beijing. One of her biggest rivals for a podium place will come from within the GB squad, in the form of Lincoln 19-year-old Lizzie Simmonds, who beat Spofforth to European Championship gold and Commonwealth silver in the 200m backstroke last year. "Lizzie is a great swimmer and a great friend who I love spending time around," Spofforth explained. "In the pool is the only time that we have this rivalry. As soon as we're out, it's back to giggles, so there is no anger between us and we're happy for each other's success." Spofforth or Simmonds, who would you back for gold in 2012? And Spofforth laughed off suggestions that the pair would be happy with agreeing to one Olympic gold medal each in the 100 and 200m backstroke. "No we haven't spoken about that at all, I think in the back of our minds we both want a gold in both events , as we have that competitive streak," she said. "We don't really speak about swimming outside of the pool, our battles stay there, but secretly I think we both want both golds. Spofforth remains unsure about what her future holds beyond the London Games but she expects to remain in Florida. "I like helping people and it is my way of giving something back," she added. "[My future] depends on what I achieve in 2012. I am looking to go to graduate school as I would like to go into counselling, but right now it's up in the air. "With the atmosphere and all of the friends in Florida I've made a life for myself and it's become my home. "Obviously it's nice to come back [to the UK] and have my dad look after me, but I feel a lot more independent in Florida and I think I'll spend the rest of my life there."